The Defense Department is not taking all the steps required by law to ease the voting process for overseas military personnel, a report from the department’s inspector general has found. 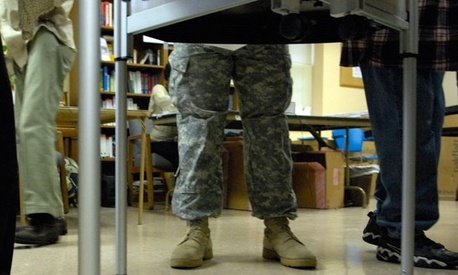 The 2009 Military and Voters Overseas Act, known as the MOVE Act, called for installation voting assistance offices on every base not in a war zone, but the IG office said about half the installations it contacted never established the offices. Base officials said they did not have the funding for the offices and argued such additions are not the most efficient way to reach their personnel. The Defense Department estimated to auditors the cost of the offices to be $15million to $20 million, according to the report. The Defense officials advocated for “easy-to-use Web-based tools” in lieu of the pricey offices, the inspector general office said. The IG also said too few people responded to a post-election survey of overseas personnel designed to assess ease of voting. The office recommended a better survey format to increase participation, as well as changes to the MOVE Act provision requiring the voting assistance offices.